The European birch, Betula pendula, is one of the northernmost of all trees and among the few trees native to Iceland. The deciduous hardwood trees and shrubs of this family, Betulaceae - are widely distributed throughout northern temperate and artic regions. The first tree in the Celtic Tree calendar is Beth the Birch. This is one of the few trees that has a rune, birkana, associated with it. The species includes, in Europe, the Downy birch Betula pubescens, Silver birch Betula pendula, and Common alder Alnus glutinosa (Alder has its own page). The American birches are described below. When most Europeans think of the birch, this graceful slender tree, native to most of Europe and south-west Asia, is the tree they think of. It grows well on light peaty sandy soils, reaching a height of 30m. The crown of the silver birch is narrow and conical with upswept branches, becoming rounded, with long hanging branchlets and a deeply fluted trunk. The bark is shiny purplish-brown in young trees, becoming pinkish-white and finally white with black diamond-shaped markings. It is this colour that gives it its name. The bark is smooth and peeling above, black and knobbly at the base. Shoots appear as dark purple-brown, with raised white warts. The silver birch's leaves are emerald green and triangular with rounded bases and double-toothed margins from 3 to 7cm long. The male flowers come in clusters of 2 to 4 drooping yellow catkins, 3cm long, at the tips of the shoots; young catkins are pale purple-brown and visible all winter. Female flowers form clusters of about 6 catkins on branched stalks below the males. At first they are erect, green and club shaped and about 1 to 1½cm long. They grow to 2 to 3cm long, become brown, hang down and release small winged fruits. 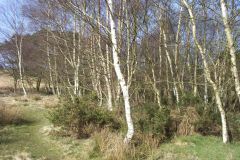 The silver birch's hard, strong, pale-brown wood is used for small turned articles and, especially in the Nordic countries, for plywood, flooring and skis. The twigs are used for brooms and brushes and the bark for roofing, tanning, etc. Birch leaves can be used as natural dies to produce yellow. The alders are also part of the birch family. Of the several tree species, these are the important ones in the United States. First is the yellow birch, B. alleghaniensis, which is the most valuable American birch in number, size, and usefulness. Then there is the sweet birch, B. lenta, is also known as the black, or cherry, birch. In the south there is the River birch, B. nigra, which is a native of river banks, lake shores, and swampy areas throughout the eastern United States. Finally the paper, or white, birch, B. papyrifera, is a tree of cold climates. It is primarily a Canadian species and is transcontinental in range. Birch trees are characterized by a smooth bark that often peels off in thin, papery layers and becomes thick, deeply furrowed, and scaly. Numerous minute male and female flowers are borne each spring on different hanging catkins of the same tree (birches are monoecious). The solitary erect fruits are conelike and are composed of many minute two-winged nutlets that mature in summer and are shed in fall and early winter. The Members of this species reach heights of 30 m (100 ft) and diameters of 1.2 m (4 ft), and many live to be more than 300 years old. The root system is typically shallow. The paper birch is interesting in that its bark was used by the Indians for utensils, canoes, and wigwam covers. It is also readily flammable and good for starting fires. Several species of birches form vast forests in far north countries. Dwarfed species grow on mountain slopes or near the timberline. Birch means protection, exorcism, purification and new beginnings, also cleansing of past and for vision quests. On Midsummer's Eve customs included decking the house (especially over the front door) with birch, fennel, St. John's wort, orpin, and white lilies. In England, a custom, dating from time immemorial, is that of using the branches and sprigs of the birch tree for decorating church for Whit Sunday. This has implications of the new beginnings idea behind the birch. Note, however, that in early Medieval times, the birch was considered as a magical tree, and the witch's broomstick was thought to have been constructed of the branch and twigs of birch. In the Netherlands, a May Day custom was for boys to diguise themselves and chase the young women with birch twigs. Those that did not escape were beaten with the twigs. This is one of the examples of birching being a fertility ritual. In many places in Holland, Germany and England, a couple moving into a new house will find neighbours have tied a bunch of birch twigs over the front door. In Holland too, a husband might symbollicallly beat his new bride with birch twigs for fertility. In the traditional handfasting ritual and gypsy marriage, the broomstick (correctly a besom) would have the brush part made of birch twigs. It is interesting to note that the birch is one of the few trees native to Iceland. It is also thought to be one of the first trees to have appeared in the north after the glaciers retreated. Some authorities say that the birch, rather than the ash is the Nordic world tree, Yggdrasil. Note however, that the second tree, and one of the most sacred, in the tree alphabet is Luis, the rowan, also called the mountain ash. Birch twigs have always been used for chastisement. There is a tradition that St. Nicholas, later called Santa Claus, would not distribute presents to naughty children, but rather birch twigs to beat them with. Freya Aswynn in Leaves of Yggdrasil suggests that all of St. Nicholas's attributes were once carried out by Woden (Odin) in the north countries. The Siberian shamans regard the birch as associated with the underworld. Magic mushrooms, the amanita muscaria, much used in shamanic vision quests mainly grows under silver birches. Additional information available from other sites: every ogham thing on the web. In most of the Germanic languages this rune has the meaning of "birch". However, the Anglo-Saxons translated it as "poplar". Birkana is the Germanic name, its Anglo-Saxon name was Beorc, and its old Norse name Bjarkan. It is the Goddess rune. Its "B" shape suggests a pair of breasts, and it is the rune of birth, mothers and children. It has the qualities of secretiveness and protection, as does the tree. The rune is associated with the goddesses Bechta, who also looks after abandoned children and Frigga who is the mother figure. Birkana is not just the birch, but represents the whole world of plants and trees. Note that most of the information about this rune was obtained from Freya Aswynn's Leaves of Yggdrasil. This information not included on this web page. This page copyright © 1996 and 2004 Derek J. Carr, United Kingdom. All rights reserved.